After a good night's sleep, we all woke up by 4:30 in the morning. Anticipation can make miracles happen and by 5:30 we were all set to start our journey. We had planned the night before to catch the first bus (the mail van) to Joshimath at 6. But to our surprise, the conductor of the bus we traveled the day before came to our room by then and informed us that they are ready to go. In no time we had occupied strategic seats in the bus to enjoy the beautiful locales on the way. 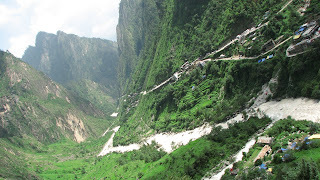 The route to Joshimath follows the river Alakananda and is a treat to watch. It was also scary at places where the roads were almost washed away by rains and landslides. Kudos to the expertise of our driver, who effortlessly drove through such narrow and dangerous roads. People who complain about potholes in Bangalore roads should take a ride through these ghat roads to understand how fortunate they really are. There are five 'Prayags' or confluences on the way to Ghangaria, where different streams join Alkananda to make it a real mighty and furious river by the time it enters Rishikesh. Dev Prayag: Bhagirathi, from Gomukh, the snout of Gangotri glacier joins Alkananda. Rudra Prayag: Mandakini, coming down from Chorabali Tal, behind Kedarnath joins Alkananda. Karna Prayag: Pindar aka Karna Ganga, coming down from Pindari Glacier joins Alkananda. Nanda Prayag: Nandakini, coming down from Mt. Nanda Ghunti joins Alkananda. Vishnu Prayag: Dhauli Ganga, coming from Mt. Dhaulagiri joins Alkananda. We had breakfast at Pipalkoti, passed Tapovan Hydro Electric area and finally reached Joshimath by 12. 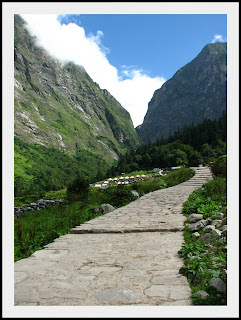 The trek to Ghangaria starts from Govindght, which is another 45 minutes journey from Joshimath (18 kms). So without wasting any time there, we took a shared sumo to Govindghat. This route is so beautiful that we even thought of getting out of the vehicle and walk our way up. But as we had the 13 kilometer trek to Ghangaria ahead of us, we controlled our urge. By the time we had our lunch it was almost 1:30. Rob and Subbu decided to keep some of their luggage in the locker available at the Gurudwara. mmmm.. now is the time to comment on the genius of Rob. Along with the stuff he left at the Gurudwara were his glasses and the camera. Ya, I cannot really blame him for both as he had a pair of cooling glasses and a spare camera with him. But as it turned out, the shades he had were no good in the night and the camera batteries which were supposed to last for the entire trip gave up on him too soon. So Rob had to walk like a blind man for the last 30 minutes of the climb. But.. but.. as I mentioned already, he did not forget his toilet paper roll...!! He even made use of it on the way up.. call of nature in its true sense!! The climb to Gangharia starts a little ahead of the Gurudwara, after crossing Alakananda by a hanging bridge. It is a climb of 1200m or 4000ft and the trail follows the river Laxman Ganga aka Pushpavathi for quite a long time. As Ghangaria is the base camp for the Hemkund trek also, there were a lot of Sikh pilgrims for company. Mules are available to carry people and it was really sad to see the poor animals carrying many a gigantic pilgrims uphill. Some city-bred lazy bums had no shame in throwing their overgrown bodies atop wounded horses and look down at others with a wry smile. There were also 70-80 year-olds who were patiently walking their way up. 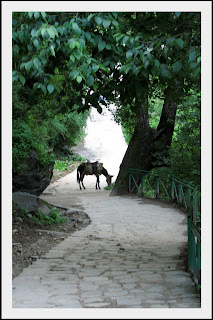 The trek route passes through two small but beautiful villages - Pulna and Byundar. There are also numerous shops on the way, selling water, soft drinks and food... just that the prices are directly proportional to the altitude. We slowly made our way up, but the afternoon sun and heavy baggage really slowed us down. Without proper acclimatisation to high altitudes, we found it little difficult to breathe properly. Ideally we should have stayed at Govindghat/Joshimath overnight so that our bodies would have got enough time to get used to the reduced oxygen levels. Halfway through the trek we realised that we won't be able to reach Ghangaria before night fall at that pace. So we hired a pony to carry our luggage. But then there was another problem... they carry your luggage only if at least one person accompanies the luggage. That responsibility was finally taken up by poor Jayan. You might think how comfortable, but the reality is that after an uphill climb like that on horse, you will literally have to look down every now and then to ensure that your posterior is still intact. No, this is not due to flat worms... just the numbness. With the luggage off our back, we covered the 13 kilometers pretty swiftly - in about 6 hours. The views around were really amazing, waterfalls, the roaring stream, mist covered mountains and lush greenery all around. Jayan had reached the village much early and had managed to arrange a decent accommodation for us. We were really fortunate to get a nice room for the five of us, with comfortable beds and mattresses at Hotel Priya. This is the first hotel as you enter Ghangaria with an eatery in the ground floor and few rooms on the first floor. Dinner was served in the room by 8 - some rice, rotis and daal. After the strenuous climb and a filling dinner, all we wanted to do was to climb under the warm mattresses. We are planning to visit the place. And we are finding it difficult to find accommodation. Please tell us the phone number of Hotel Priya. Very lovely pictures. I really liked your post. Keep sharing. Visitors from all over the country visit the charming town to witness this unique phenomena. The close proximity to the important pilgrimage town of Kedarnath makes Rudra Prayag one of the most sought after destinations. Check out best hotels in Rudraprayag also.